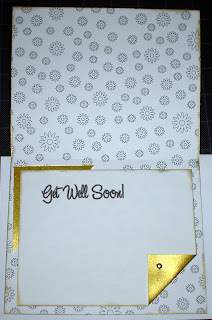 I offered to make a get well card for a co-worker who had her tonsils out a few days ago. I wanted to try the butterfly technique I saw on Craft TV Weekly, so I made that first. It's made from a magazine page, stamped and embossed with gold. The black backing is also stamped and embossed in gold. The wings were cut out with tabs that fit in slits made in the black backing. 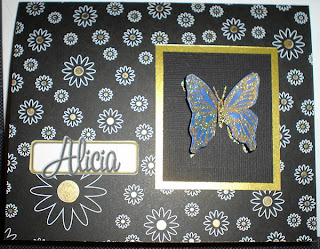 I chose some Imaginisce "Black Tie Optional" paper, cut and scored it to fit the envelope and attached the butterfly with gold matting on the front. I colored in the centers of the flowers on the patterned paper with gold pen, printed out her name on the computer and cut it out. Inside, I added a plain white area so co-workers can sign the card and send their personal greetings. Gold matting and a brad complete the inside of the card. I hope it makes her feel better!